LMI Pump RPM Kits – Preventative Maintenance Kits for LiquiPRO Chemical Metering Pumps are available for all LMI Chemical Metering Pumps. 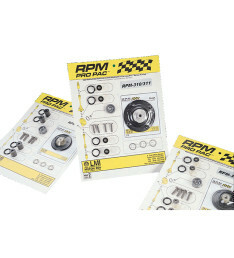 RPM Pro Pac™ Kits include all of the parts that are required for routine preventive maintenance. The convenient, clear skin packaging and liquid end drawing ensure quick and easy replacement of expendable parts. LIQUIPRO™ Liquid End RPM Kits, ROYTRONIC® Liquid End RPM Kits, ROYTRONIC® High Viscosity Liquid End RPM Kits and Series G RPM Kits. RPM Kits Feature: Instruction Sheet, Replacement Liquifram™, Cartridge Valves – suction and discharge, Injection Valve components, O-Rings and Shaft Seal.